This light, easy to apply Face Cream combines the antibacterial power of Tea Tree Oil with natural, skin loving ingredients to moisturise and maintain clear skin naturally. Hydrates skin without clogging pores. Restores the skin’s natural moisture balance after cleansing and toning. Contains a balanced blend of natural moisturisers including Macadamia Oil, Rose Hip Oil, Vitamin E and Shea Butter to restore the skin. 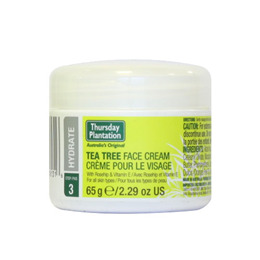 Contains 100% pure Australian Tea Tree Oil to help maintain clear skin. Aqua / Water, Caprylic/ Capric Triglycerides, Cetearyl Alcohol, Glycerin, Glyceryl Stearate, Sorbitan Olivate, Cetearyl Olivate, Macadamia Integrifolia Seed Oil, Rosa Canina Fruit Oil, Tocopheryl Acetate, Butyrospermum Parkii (Shea Butter), Phenoxyethanol, Caprylyl Glycol, Melaleuca Alternifolia (Tea Tree) Leaf Oil, Xanthan Gum, Allantoin, Citrus Aurantium Dulcis (Orange) Peel Oil, Lavandula Angustifolia (Lavender) Oil, Aloe Barbadensis Leaf Juice Powder, Limonene, Linalool. After cleansing and toning, gently massage mornings and nights into the skin on face and neck area.It is recommended you skin patch test prior to use. For external use only. 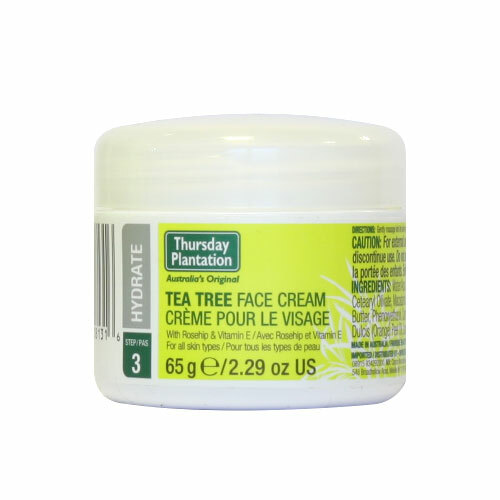 Below are reviews of Thursday Plantation Tea Tree Face Cream - 65g by bodykind customers. If you have tried this product we'd love to hear what you think so please leave a review. This light, easy to apply Face Cream combines the antibacterial power of Tea Tree Oil with natural, skin loving ingredients to moisturise and maintain clear skin naturally.